The Chick-fil-A Leader Academy is a year-long program for freshman through seniors that prepares students for a successful future as a dynamic leader. The program features monthly leader labs that focus on core leadership principles and culminates in an impact project. Leader Academy focuses on the following leadership insights: vision and values, servant leadership, teamwork, communication, innovation, and impact. For more information, check out the Chick-fil-A Leader Academy site. Get ready for the most exciting year of your life! Participating in Chick-fil-A Leader Academy not only shows colleges and future employers that you are great, but it also prepares you for a successful future as a dynamic leader. Each year provides opportunities to showcase your talents and put what you learn into action through your Impact Project. Please note that only thirty students will be chosen from the applicants to participate in the Chick-fil-A Leader Academy each year. Chick-fil-A Leader Academy helps prepare your children for a successful future. This program provides an opportunity to learn what makes a great leader while giving them tools to put what they have learned into action. Chick-fil-A Leader Academy prepares them to be their best! Have questions about the program? Our Leader Academy Coordinators are happy to answer your questions and provide support. 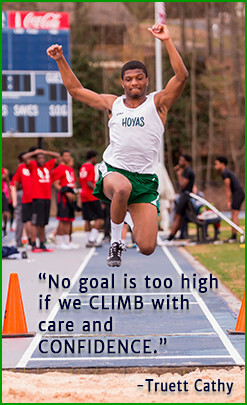 Hoyas is a Registered Trademark of Georgetown University and used under license by Carl Harrison High School.